Microsoft doesn't support porting Android apps to Windows phone any more! 1. APKPure can help Windows phone 10 user convert APK to APPX, but we can't guarantee all APPX will 100% work on your Windows mobile devices. 2. APK to APPX Converter is a web based online APPX Converter, it can covert unmodified .apk file to .appx file which can smoothly work on Windows 10 OS mobile. (v)Any errors or omissions in any content or for any loss or damage of any kind incurred as a result of the use of any content posted, emailed, transmitted, or otherwise made available via the APKPure service. APKPure does not warrant, endorse, guarantee, or assume responsibility for any product or service advertised or offered by a third party through the APKPure service or any hyperlinked website or featured in any user status submission, and APKPure will not be a party to or in any way be responsible for monitoring any transaction between you and third-party providers of products or services. As with the purchase of a product or service through any medium or in any environment, you should use your best judgement and exercise caution where appropriate. And again, use APKPure APK to APPX Coverter just for fun. Please make sure you upgrade to the W10M which built in AOW (Android on Windows) substrate, otherwise please do not try to install APPX file. 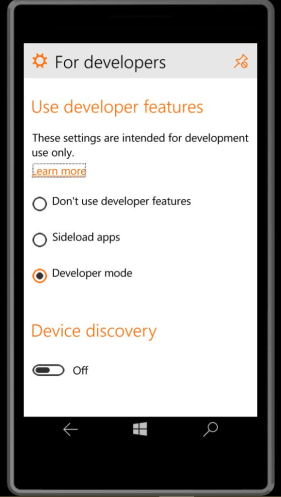 Enable Developer Mode for Windows 10 Mobile Technical Preview on your phone. Not all the APPX files converted form .apk can work properly or be installed successfully. Note: Get free upgrade selected Windows Phone 8.1 devices to Windows 10 Mobile when it's available. You can download apk files and convert to appx manually on apkpure.com. APKPure definitely will be the best alternative Windows Mobile Insider/Windows phone app store in future where you can download Windows Phone Apps+Games. You can use our online APK to APPX Converter to convert Windows .appx apps, Make sure you’re only installing these apps from trusted sources and always keep a Windows 10 system recovery image or backup handy in case you run into issues. Make sure your Windows 10 Mobile have an "Android Subsystem" within, which run build 10.0.10536.1004 or above otherwise please leave it alone. Before install .appx on your device you need enable developer mode on Windows 10 device and we have been listed some of supported Windows phone 10 devices above. On your device that you want to enable, go to Settings. Choose Update & security. Then choose For developers. After you enable Developer mode on Windows 10 Phone:You can install any app package (.appx) and run it without needing the certificate. Basically you are putting your phone in testing mode to install and try out an app that you trust. You can install any .appx sent to you via email or on an SD card too. Click the file to install if you have chosen developer mode for your settings.